2012 has been extremely disappointing in respect of the weather. You would think that by mid-June we should be sipping Pimms in the sunshine, bunging the charcoal on the BBQ and picnicking the weekends away. There has been rain, rain and more rain. Yet I remain optimistic that we will have a summer at some point. 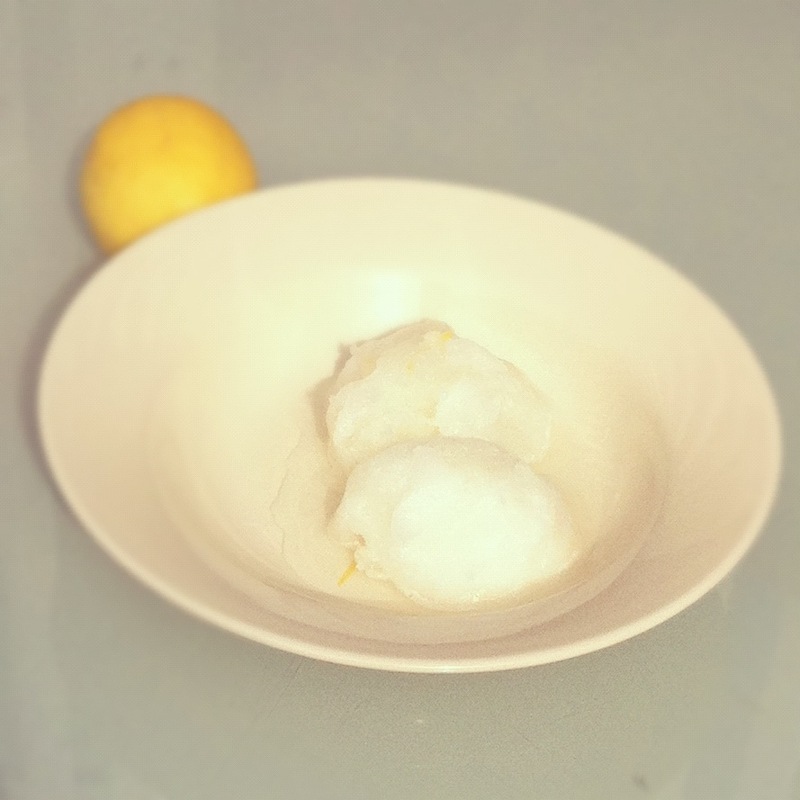 And when it does finally arrive you’ll be thankful to have some tangy, cool and refreshing lemon sorbet in the freezer. You don’t need a long list of ingredients. You don’t need any special equipment to make it. In fact, a simple lidded plastic container is all you need so don’t fret that you don’t have an expensive ice-cream maker to hand. Wash lemons, then peel the zest and juice them. Place into a pan along with the water and sugar. Heat over a medium heat, stirring continuously until sugar has dissolved. When the sugar has completely dissolved and the mixture looks syrupy turn off the heat and allow to cool for ten minutes. Pour into a tub and cover tightly with a well fitting lid. Place in freezer. After 2-3 hours begin to check. If the mixture is still liquidy put back in freezer and check in another hour. If it has started to set mix and stir vigorously with a fork making sure you break up the crystals thoroughly. Place back in freezer for another hour or two and repeat. This can be repeated several times throughout the day. Alternatively, you can do what I did which was to leave it overnight, then use a stick blender to break it all up and mix it through thoroughly yet again. Freeze until set and serve as required. This is a wonderful, light end to a heavy meal or an over-indulged BBQ with the family. I used 580 g of sugar instead of 800 g and it was still too sweet. I’ll try it with 400 g next time.